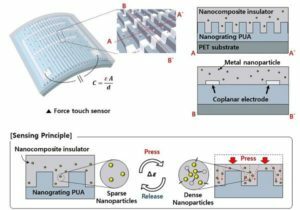 Researchers from KAIST have reported a high-performance and transparent nanoforce touch sensor by developing a thin, flexible, and transparent hierarchical nanocomposite (HNC) film. The research team says their sensor simultaneously features all the necessary characters for industrial-grade application: high sensitivity, transparency, bending insensitivity, and manufacturability. Force touch sensors that recognise the location and pressure of external stimuli have received considerable attention for various applications, such as wearable devices, flexible displays, and humanoid robots. For decades, huge amounts of research and development have been devoted to improving pressure sensitivity to realise industrial-grade sensing devices. However, it remains a challenge to apply force touch sensors in flexible applications because sensing performance is subject to change and degrade by induced mechanical stress and deformation when the device is bent. The proposed non air-gap force touch sensor is based on a transparent nanocomposite insulator containing metal nanoparticles which can maximise the capacitance change in dielectrics according to the pressure, and a nanograting substrate which can increase transparency as well as sensitivity by concentrating pressure. As a result, the team succeeded in fabricating a highly sensitive, transparent, flexible force touch sensor that is mechanically stable against repetitive pressure.